The Power Panel was designed by Phil Riehlman and is based off of the Dodge Power Wagon. Its an underrated casting believe it or not. Not being a very good track car, it has a tiny cult following of customizers and I believe the Hot Wheels Graphics Team are secretly fans of this casting as well. 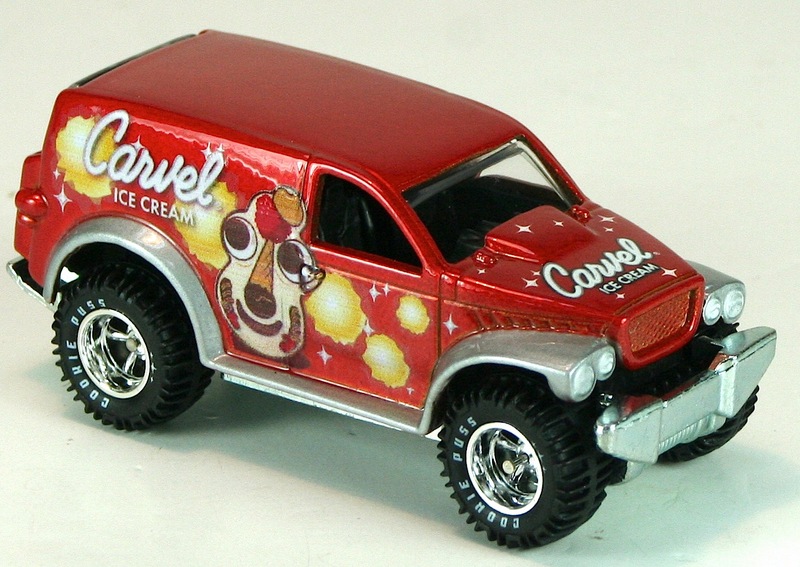 As of late, this casting has been featured in premium lines (Nostalgic Brands/Carvel in 2012 & Hot Wheels Delivery in 2010) due to its real estate for large graphics. Its a relatively easy casting to find since it is definitely not hoarded by any measure and basic versions are in 5-packs which have some of the easiest vehicles to find. The Power Panel shown below is from the Creature Cars 5-Pack of 2009. The 5-Pack featured 3 realistic vehicles (Power Panel, 8 Crate & La Troca) with “creature” graphics while it also contained two fantasy “creature” cars in the Croc Rod & Arachnorod. The Power Panel came in metalflake blue and had graphics of a Giant Squid/Octopus. A variation of this particular version was found as well. The earlier version of the 5-pack contained the Power Panel with Chrome Off Road 5-Spoke (OR5SP) Wheels (shown below), while later versions of the 5-pack contained the Power Panel with Black Off Road 6-Spoke Wheels with a Chrome Lip. The Power Panel casting was released in 2003 as part of the 2003 First Editions and has had over 14 versions come out ever since! 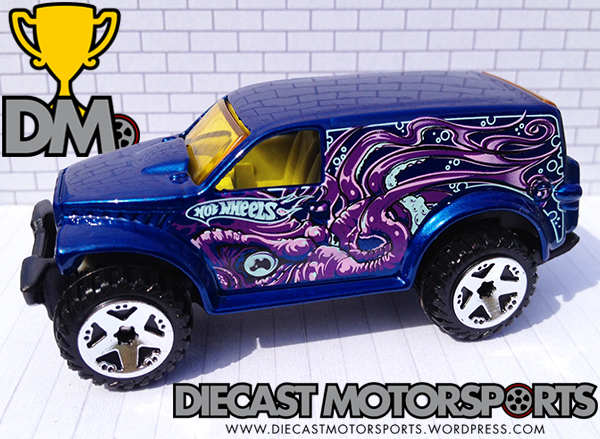 This is definitely a cool truck and one, that if you wanted to start collecting a particular casting, you would not have to break the bank trying to track down every release. RELEASE DETAILS: Metalflake Blue Body (metal). Yellow-Tinted Windows. Light Gray Interior. Chrome Off-Road 5-Spoke (OR5SP) Wheels. Black Base (plastic). Made in Thailand. Toy# N4070. Release in 2009 as part of the Creature Cars 5-Pack. This is one of my Top 5 FAVES! Thanks for doin’ it on DIECAST MOTORSPORTS….”Chuckles The Musical Monkey” was prolly the hardest & priciest one for me to find out of all of ’em.